It currently takes about two weeks to tell that a disease has moved into the human population, since detection systems rely almost entirely on doctors analyzing individual patients and reporting suspicious diagnoses to health organizations. Hoping to speed up this process is Project Premonition, an autonomous drone-based system currently being developed by a team of Microsoft researchers which aims to predict infectious diseases before they infect humans. Project Premonition is currently being developed in Grenada, where researchers are using drones to collect information from microorganisms in the environment. 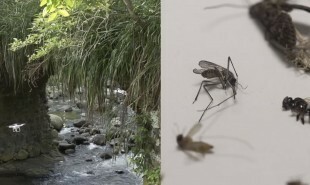 The system aims to monitor infectious agents — such as mosquitos — as they move across the world, enabling an early intervention before they cause an outbreak in human populations or wildlife. Eventually, the researchers envision a global project that uses autonomous drones, which can safely fly in and out of environments collecting samples with advanced traps. The samples will then be processed using gene sequencing and algorithms to spot pathogens within gigabytes of data. How else could drones be used to assist vast operations of research?